Posted on 8, March 2018 by EuropaWire PR Editors | This entry was posted in Food & Beverage, Retail, Technology, United Kingdom and tagged app, Co-op, Elliott Goldenberg, Matthew Speight, Payments, retail, shoppers. Bookmark the permalink. MANCHESTER, 08-Mar-2018 — /EuropaWire/ — The old adage that the UK is a nation of shopkeepers could soon ring true as the Co-op today, Wednesday, 7 March, unveils a convenient future where customers can check-out their own purchases on their phone, without visiting a till. 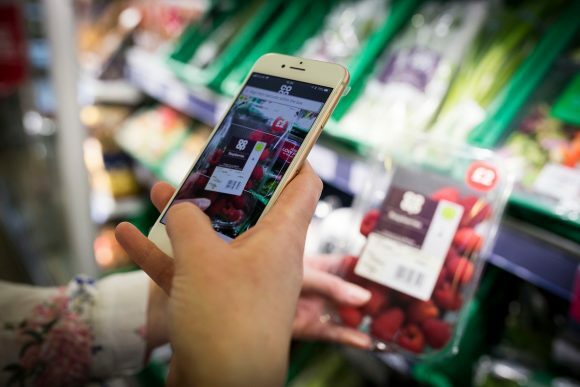 Time-pressed shoppers will soon be able to pay in the aisle and avoid visiting a till all together as they use their own phone to purchase goods at the Co-op with an innovative easy to use App built with Mastercard’s secure digital payments expertise. The shop, scan and go initiative is being trialled at the Co-op’s store located at the retailer’s support centre in Manchester, with a wider roll-out beginning as early as this summer which is expected to include a further trial at the Co-op’s store located in the UK HQ of Microsoft, Reading. The technology sits alongside conventional payment methods in store – such as self-service tills and manned checkouts – in order to enhance consumer choice and service. The innovative move, which harnesses the latest technology, allows customers to scan products on their own device as they walk around the store – known as a “frictionless shopping experience”. When they have finished shopping, the amount they owe will then be deducted from their account with a single click. “Technology is bringing unprecedented change to retailing right before our eyes, however the challenge for all of us who play a part in the retail experience is meeting the needs of all consumers who are moving at different speeds in the adoption of technology.” said Elliott Goldenberg, head of digital payments at Mastercard UK. The technology also links information from a customer’s Co-opMembership account – telling shoppers how much they have saved and, how much the Co-op will donate to local good causes following the transaction. Members receive a 5% reward when they buy own brand products and services, with the Co-op donating a further 1% to good causes – last year the community retailer shared £20M with around 8,000 community groups. Earlier this year the Co-op unveiled plans to open 100 new food stores in 2018. It also announced a £50M price investment programme to cut the cost of everyday essentials including fruit, vegetables, bread, fresh meat and ready meals, as well as household brand names.